A disastrous fire in the subway of Baku, the capitol of Azerbaijan, occured on Saturday the 28th of October 1995. The fire caused the death of 289 passengers. At least 750 people were saved, of which 265 were severely injured. The fire was caused by an electric failure in the power supply of the fourth carriage. A fully loaded 5 car metro train stopped about 200 m after Uldus station due to sparkover/ electric arc in electrical equipment in the rear end of the fourth car. The fire rapidly spread to car 5. Because of problems with the opening of doors in car 4, the passengers were forced to evacuate through car 3. Many travellers, narrow tunnel cross-section and the door problems lead to slow evacuation, and panic arose. Authorities in Azerbaijan have not ruled out the possibility that the world's worst underground-railway disaster, which claimed some 300 lives in Baku, could have been the work of a saboteur, according to reports from the region last night. President Geidar Aliyev told a US diplomat that, while preliminary information pointed to a technical fault, the tragedy was "possibly an organised act of sabotage", said the Azeri news agency, Turan. Initially the government said the disaster was an accident caused by outdated Soviet equipment. 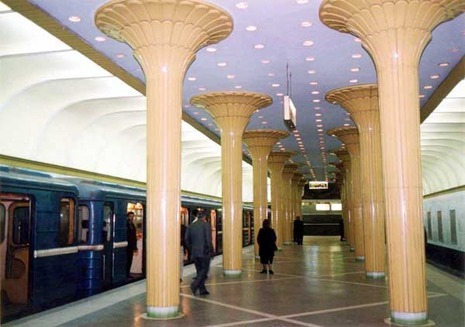 This was despite the fact that the Baku metro has been bombed twice in the past 18 months, with the loss of 20 lives. Rescue workers recovered about 300 bodies today from the wreckage of a subway train that caught fire Saturday in Baku, the capital of Azerbaijan, officials said. At least 200 more people were injured. Unable to escape from the packed cars, most of the victims were killed by carbon monoxide poisoning from burning toxic materials in the train carriages, officials said.